Hand-carding is a traditional method of preparing fleece and fibers for spinning soft, lofty yarns of varying fiber lengths. 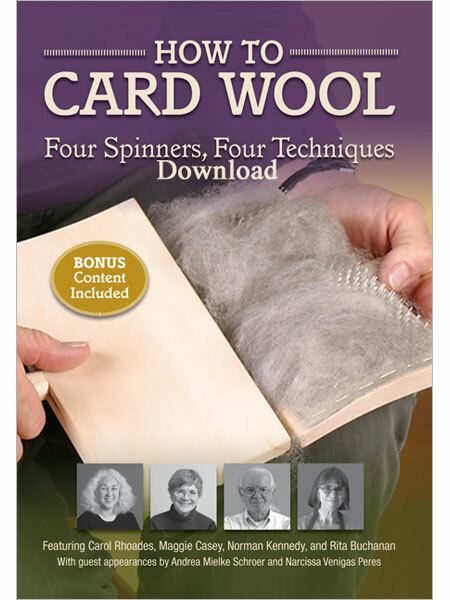 The purpose for carding is to separate and straighten the wool fibers. The result is a batt or rolag of lofty wool that makes spinning easier. Hand-carders are a pair of wooden paddles with wire faces. The wire teeth are either course or fine. The course teeth are for carding wool, mohair and course fibers. The fine teeth are for carding cotton and softer fibers like angora. Take one of the carders in your left hand and with your right hand, lay staples of wool across the teeth of the carder. Distribute the wool evenly across the entire card until the teeth are barely showing through. Take the second carder in your right hand and position it directly over the left card. Gently brush the right carder across the teeth of the left, towards you. Do this five to ten times until the fiber is evenly distributed on both cards. Take the "toe" end of the stationary carder (bottom edge), and line it up with the "heel" (handle edge) of the working carder. Lay the ends of the fiber onto the teeth of the carder, and lift them up to transfer the remaining fibers to the working carder. Roll the fiber toward the handle of the carder to form a rolag for spinning.